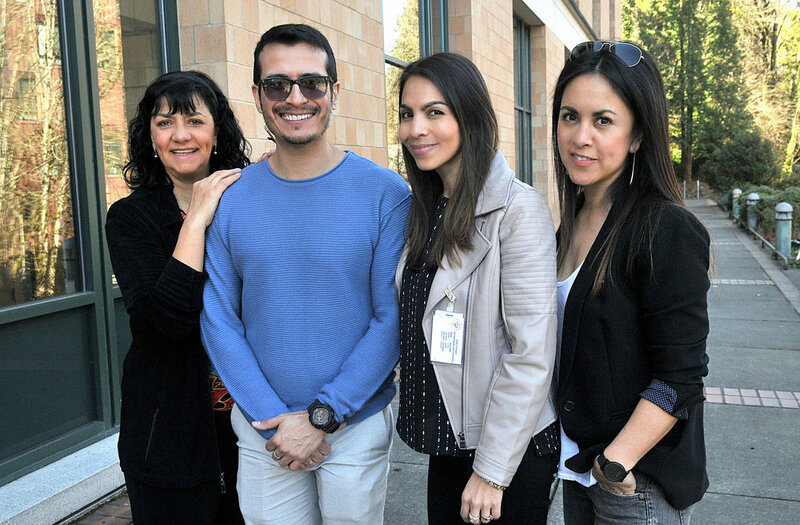 From left: Executive Director Susy Molano, Training Director Guillermo Ortiz, Master Interpreter Project Manager Alma Gomez and Events and Development Manager Carola Ibanez. Not pictured is Training Director Mary Soots. Our new mission (To advance the Health Care Interpreter [HCI] profession to improve health outcomes for our community) and vision (A highly skilled HCI community that is economically successful and valued as an integral member of the health care team) statements reflect the passion and commitment that OHCIA has for the interpreting industry, diversity celebration, culture awareness, and workforce opportunities for everyone without the barriers of background, ethnicity, language, religion, and/or physical ability. At OHCIA diverse perspectives, cultures, and values are accepted, appreciated, and celebrated, and we would like YOU to be part of it. We are extremely grateful for the recent opportunity we had to be interviewed by the Lake Oswego Review - part of a conglomerate of 26 local newspapers - to provide insight on the health care interpreting industry, the ever-growing need for trained interpreters, and the different programs/projects our association is currently working on. In the article“Health care interpreters see an increasing need” the Diamond Project is mentioned. The Diamond Project is a scholarship program established to provide scholarship awards for promising students with financial hardships who would like to become medical interpreters and obtain the necessary credentials to provide professional services to the LEP (limited English proficiency) community. Such awards are made possible through the generous and sustainable contributions from donors like YOU! The Pacific Northwest Interpreter HUB with access to its web-based interpreter portal and the vast experience in the field of a great team of Master Interpreters was also brought up to light during our conversation with Lake Oswego Review. We are now pleased to say that we are offering FREE membership to interpreters with all levels of experience. To register, visit our online portal by clicking the button below. LET'S CELEBRATE DIVERSITY AND PROVIDE THE SUPPORT TO THOSE who NEED IT! Have you heard of the famous phrase, “Think globally, act locally”? Simply expressed, it means: be open-minded about learning about issues, cultures, and events around the world, and make use of this knowledge to improve your local area, hometown, or country. This is YOUR time to make a high-impact change here in your community. Click the DONATE button below to start supporting OHCIA! So you completed your 64 hour training, what's next?!? Don't stop there, complete the healthcare application to get your process started with the Oregon Health Authority to achieve your qualification or certification with the state. The online application is located at the Oregon Health Authority Office of Equity and Inclusion's website. If this message is not eventually replaced by the proper contents of the document, your PDF viewer may not be able to display this type of document. You can upgrade to the latest version of Adobe Reader for Windows®, Mac, or Linux® by visiting http://www.adobe.com/go/reader_download." If you get this, don't panic! Although there are instructions that you can follow to fix the problem, we have done the work for you and you can now access the application and program requirements by simply clicking the buttons below! 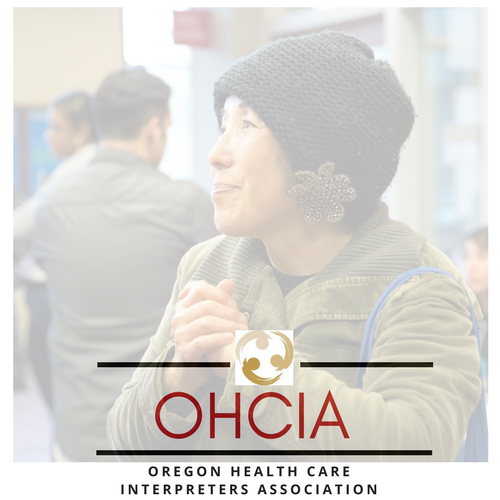 Portland, Oregon, January 16, 2017 – The Oregon Health Care Interpreters Association (OHCIA), a nonprofit entity under the laws of the State of Oregon, was founded April 4, 2011 with the goal of promoting and furthering the advancement of the health care interpreter profession. As Oregon and the United States as a whole becomes more linguistically diverse, working with professional, trained, and certified interpreters in health care settings is more important than ever. It is well documented that Limited English Proficient (LEP) patients have difficulty accessing medical care and have poorer health outcomes than the population at large. OHCIA represents the professional interests of health care interpreters and promote cooperation with government agencies, consumers and other bodies on matters which concern those interests. OHCIA works to maintain and advance high standards of professional ethics, practices, and competence by supporting educational efforts of health care interpreters and by preserving their professional rights. In addition, OHCIA serves as a resource center for the collection, sharing, and dissemination of information for health care interpreters, health care providers, and the public at large. Through a grant from the Kaiser Permanente Community Fund at Northwest Health Foundation, OHCIA will be able to implement the creation and development of the Pacific Northwest Interpreter Hub. The HUB will bring together partners to increase quality and consistency in the field of health care interpreting, improve economic opportunity and quality of life for interpreters, and reduced health disparities for patients with limited English proficiency. The HUB represents a shared partner commitment to breaking down silos and better aligning collective efforts to improve service quality, better support practitioners, increase career opportunities, and impact patient outcomes. Health care interpreters will receive assistance in reaching their professional development goals including discounted training rates, access to financial hardship scholarships, and the support of a master interpreter who will guide them through the certification process and career development. In addition, member interpreters will have their information included in the Hub portal, which will be utilized by language services agencies for job placement. The mission of Northwest Health Foundation is to advance, support and promote the health of the people in Oregon and Southwest Washington. By joining with communities that face the biggest barriers to health, we can create strategies that improve the lives of everyone. opportunities (especially for refugees, asylees and immigrants). of our patients and communities. With a fresh, new start in 2017 just around the corner, we would like to encourage all interpreters to consider some great New Year’s Resolution goals! 1. Set aside some time in January to reflect on how you are doing as an interpreter, and how you can improve. Providing language access to those who need it is deeply rewarding, but it can also be mentally and emotionally taxing. Ask yourself: What energizes me the most about this work? What is challenging for me? Where could I improve in my skills and knowledge? What support, coaching, or training do I need in 2017 to be a more effective interpreter? 2. Register for an interpreter training to improve your skills. 3. If you aren’t already Oregon certified or qualified as a health care interpreter, figure out your next step. Becoming certified or qualified will increase your opportunities for career growth in the interpreter profession. Learn more about the requirements from the Oregon Health Authority Office of Equity and Inclusion here. 4. Find ways to get more involved! Volunteer to interpreter at a low-income medical clinic, such as Clackamas Volunteers in Medicine in Oregon City. Or take the initiative, and form a skills practice group with other interpreters you know. Consider volunteering with us; learn more here. 5. Visit our website or call the Office Equity and Inclusion for questions about health care interpreting. Wondering if becoming a health care interpreter is worth it? Enjoy, and post your thoughts! We are happy to inform you that the Oregon Society of Translators and Interpreters (OSTI) is organizing an important presentation on American Society for Testing and Materials (ASTM) standards on May 19, 2016 from 11:00 a.m. to 1:00 pm at the Oregon Health Authority Transformation Center Conference Room, 421 SW Oak St., Suite 775, Portland, OR 97204. Further Information on this presentation is available from the link below. We hope to see you at this presentation. Note: the exams offered by CCHI and NBCMI are for interpreters looking to get certified as a health care interpreter in Oregon (certification is only available for Arabic, Cantonese, Korean, Mandarin, Russian, Spanish, and Vietnamese). Getting certified is great way to improve compensation and hiring opportunities as a interpreter. For all requirements of Oregon certification (and qualification), visit our website. Join us to learn how to prepare for the CoreCHI "written" and CHI oral exams and what to expect at the testing site on the exam day. CoreCHI exam tests the interpreter's professional knowledge regardless of the language of interpreting as well as their critical thinking and ethical decision-making skills and abilities. Both CCHI's exams are full certifications at the national level and are accredited by the National Commission for Certifying Agencies. OHCIA Board Member Dr. Morad Noury posing with the Oregon Health Authority Office of Equity and Inclusion Director Leann Johnson after receiving the award on March 14th, 2016. OHCIA Board Member Dr. Morad Noury received an award of recognition for his service to the Oregon Council on Health Care Interpreters. Dr. Noury demonstrated great professionalism and expertise in the field of interpreting, and a commitment and dedication to the field of health care interpreting, insuring that Oregon limited English proficient clients receive the best service they can get by providing health care interpreters who are qualified or certified under Oregon standards. The ceremony took place at the Office of Equity and Inclusion of the Oregon Health Authority on Monday, March 14th, 2016. Prior to the ceremony, Dr. Noury received a letter of gratitude from Governor Kate Brown appreciating his service to the Oregon Council on Health Care Interpreters and to the State of Oregon. Susy brings to the job not only her many years of experience as a certified medical interpreter, founder, president, and member of the board of directors of the association, but also her knowledge in business and human resource management. She earned a law degree in her native Colombia, and then went on to pursue her Associate of Science and Business Management Development degrees. Her postgraduate studies include a degree in Human Resource Administration from the Universidad de Los Andes in Bogotá and a Certificate of Professional Development from Portland State University in the Comprehensive Human Resource Management Program.